Create the perfect corner sofa for your living room, starting with the Maddox Corner module in Eleanor Silver. Add left-hand, right-hand, and armless modules from the Maddox range to build a corner sofa that perfectly suits your layout and your lifestyle. 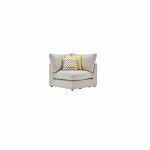 With smart clean lines, enhanced by the accent piping on the arms and cushions, it’s a versatile and stylish addition to any home. Crafted with a solid hardwood base, real oak feet, and fibre-filled cushions, you can depend on the Maddox Corner module to provide comfort and durability for the long term.